Ugh, I HATE ACNE! Who doesn’t though? 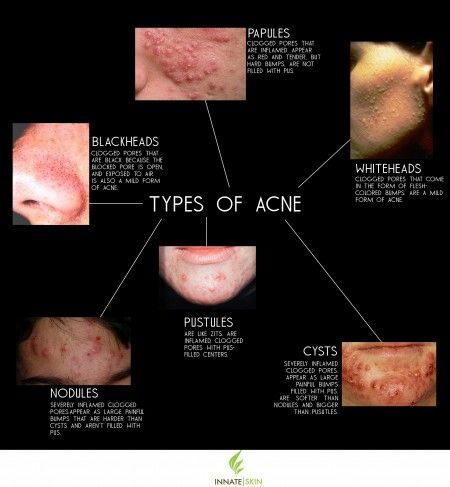 Acne is why I became obsessed with skin and why I chose a career in esthetics. I resented spending my money on products that over promised but under delivered. Acne is a sinister inflammatory disorder of the skin marked by papules, pustules, comedones and/or cysts. It has an unsavory ability to leave a lasting impression long after it’s gone; sometimes it never really leaves. Fortunately there’s help for us all, but for now I would like to start by describing types of pimples, grades of acne, causes and types of acne, and finish by leaving you with a few tips on controlling breakouts. 1 .) HORMONAL ACNE – normally found on the chin and/or along the jaw (think muzzle or surgical mask). It doesn’t necessarily mean that your hormone levels are off their normal levels, it just means that this is the zone of the face which is very responsive to any changes in progesterone, testosterone and stress hormones. Pregnancy, oral contraceptives, and menopause are common triggers of hormonal acne. You’ll need two things in your skin care routine: an anti-inflammatory treatment (benzoyl peroxide or salicylic acid) and a preventor in the form of a retinol. Also take a look at your skin care and makeup. Are you using harsh exfoliants which will spread your acne by leaving tiny cuts behind where bacteria can set up shop and multiply? How are you cleansing your skin? Is your makeup long wearing ? Is it heavy/full coverage? Try switching to a lighter formula and building coverage only where you need it. The tiniest changes can help big time. 2) ACNE COSMETICA – Comedogenic or irritating ingredients in products such as makeup, laundry detergents, or hair care cause acne cosmetica. Try regularly cleaning pillow cases and cleaning makeup brushes once a week or two . Obviously you’ll need to discontinue using which ever product gave you acne cosmetica if you know what it is. 3 .) INFLAMMATORY ACNE – is chatacterized by redness and it may be uncomfortable . 4.) ASPHYXIATED ACNE -is characterized by a rough surface because of a keratolytic buildup paired with reduced cell turnover that traps sebum. Asphyxiated acne is common in dry environments and may be the result of using skin care products with drying ingredients, alcohol for example, without the use of a daily hydrator . Again Retinol will speed up cell turnover and dissolve the bonds holding the dead skin cells to the follicular walls and surface while killing the bacteria trapped beneath the keratolytic buildup . 5.) BACTERIAL ACNE – Propionibacterium Acnes (P. Acnes) is the bacteria responsible for acne. It flourishes in warm, humid environments but cannot live in the presence of oxygen. That’s why benzoyl peroxide and salicylic acid are TOP DOG at killing off acne lesions as they drive oxygen into pores and obliterate P. Acne bacteria. 6.) CYSTIC ACNE – if you have cystic nudules you know it because the are painful. They dwell beneath the surface of your skin and sometimes remain for weeks or months. 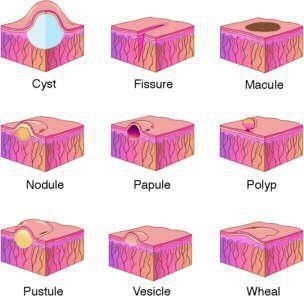 Scars are far more common with cystic acne because of their depth and the severe inflammation that destroys the follicle. 7.) SYSTEMIC ACNE – is a acne vulgaris on other areas of the body such as arms, back, chest and shoulders and face too. Disease, illness, medication, or diet-related issues may be culpable, but you’ll need to go see a Dermatologist to get the most effective treatment. Androgen hormones are a group of hormones (primarily testosterone and androsterone) that controls the development and maintenance of masculine characteristics. While present in both ladies and gentlemen, levels are much higher in men. In women, androgen is converted into estrogen. High androgen levels result in “virilizing effects” equaling acne and hirsutism (excessive hair growth in inappropriate places of the body). If acne is present on the skin, androgen hormones increase the adherence of keratinocytes to the follicle wall and increase sebum production. That my friends, is how you develop clogged pores! Papules form due to increased sebum and P. Acne bacteria that build up BEHIND the plug and trigger an inflammatory response in your skin. P. Acnes grow, multiply, and generally reek havoc and cause inflammation. Inflammed ruptures in the follicle wall cause inflammation & tissue destruction with possible scaring. GRADE I – May include open or closed comedones. Inflammatory lesions and cysts aren’t typical. Scaring is unlikely because lesions tend to be superficial. Hyperpigmentation and texture changes are possible if you are doing extractions at home. GRADE II – Open and closed comedones are common in both GRADE I and GRADE II, however papules and pustules are unique to GRADE II acne simplex. Scaring begins to rear it’s ugly head in the acne vulgaris category. Sometimes medical intervention is necessary because ultimately when all is said and done, having scars can make us feel as bad as having acne does. It’s like great, my acne is gone and my skin is clear, but I’ve got permanent scaring! It is just unfair. GRADE III – Inflammation, bacterial lesions, open/closed comedones, and scaring. GRADE IV – Cystic and nodular lesions are typically saved for GRADE IV acne vulgaris and medical intervention may be absolutely critical to not only clear up your lesions , but to rid your skin of hyperpigmentation and scaring. Your dermatologist can absolutely help reduce the amount of scaring and erase it all together with lasers. However, if you are a person of color, you gotta be REEEAALY careful with lasers because the wrong one can hyperpigment you for life. ALWAYS go to a derm for laser work. It is absolutely possible to obtain clear skin with the help of an esthetician and the sooner you get help the better. For my clients who are dealing with acne I make it crystal clear that there is no known cure for acne, but there are ways to control it and clear it up. Then I stress the importance of establishing a facial schedule of one peel every two weeks to rid the skin of bacteria, boost collagen and elastin production (to plump up the “pits” of scas) and quickly fade inflammation and hyperpigmentation. A few clients who have come to me with acne have been able to get one facial a month and get clear skin, but those clients were usually breaking out because they were over exfoliating in combination with failing to use moisturizers, doing something else to disrupt their skin’s barrier or pH levels, or generally introducing their complexion to bacteria on a daily basis. Lastly I prescribe the appropriate cleanser, toner, retinol, moisturizers and any additional serums their skin may need. Blended peeling agents that control bacteria & oil production while loosening the impacted stratum corneum which not only opens pores, it allows treatment products to penetrate more effectively. Topical retinoids , salicylic acid , Azelaic acid, alpha hydroxy acids and sulfur are ideal when treating this major cause of acne. Over drying skin makes skin produce sebum in excess which causes more breakouts!! You guys, it’s so true!!! Please please please stop using alcohol and washing your face three and four times a day!! It’s counterproductive. It’s inappropriate. It’s just wrong!!! Can you tell how I feel by the number of exclamation points I have used? Hehe. Try natural astringents that moisturize will avoid over-production of sebum. Also salicylic acid, ginger root, green Burnet root, Licorice root, cucumber extract and cinnamon bark help control sebum. You can use Borage seed oil, Grape seed oil and essential wheat germ oil to balance Oily and acneic skin. First things first: control bacteria population! Aim for antibacterial & antimicrobial topical agents and oral or topical antibiotics. Visit your dermatologist (not your GP) to see if your acne needs to be treated with antibiotics or not. Next, topical sources of oxygen such as benzoyl peroxide and hydrogen peroxide are imperative because p. acnes are anaerobic. Review your current skin care and make any appropriate changes and seek the help of an esthetician for in-office treatments that increase circulation/blood flow to deliver oxygen which kills P. Acnes and assists in clearing breakouts. Inflammation is both the cause and result of acne . When the amount of P . Acne bacteria increases, sebum is broken down into irritating free fatty acids causing your immune system to sit up and take notice. White blood cells weaken the follicular wall resulting in a rupture and increased inflammation. Aim at using anti-inflammatory topical ingredients designed to both soothe current irritation and help avoid future inflammation. Aloe vera, salicylic acid, bisabolol, panthenol, licorice extract, and EGCG from green tea are all very helpful. Inflammation is the cause of the hyperpigmentation left behind by pimples. It’s actually called Post-Inflammatory Hyperpigemtnation. Exposing those dark spots to the sun won’t even out your skin tone. The sun will only make matters worse because it’ll darken those spots even more and make them harder to get rid of. Plus, a lot of the ingredients that are used to clear your skin cause you to be slightly more sensitive to burning. NOBODY wants burned, hyperpigmented, acne riddled skin. Ain’t nobody got time for that! Bottom line: just because acne is a tough case to solve doesn’t mean it isn’t possible. It make take professional help, but at least you’ll have healthy, clear skin. If you need help or have questions leave them in the comment box and I’ll answer them to the best of my ability.